As a first grade teacher for many years, I have always loved Ron Roy's A to Z Mysteries. I often read the first book, The Absent Author to my class as a read aloud and I loved seeing how it hooks children in reading. Well, I have my own first grader at home this year and I have to tell you that the genius of these books is even more clear to me now. This year I have read more than half of the series with my son and each one is highly addicting and fun in a unique way. We recently discovered the Super Editions as well. These editions seem slightly higher in reading level but even more mysterious! Also, we loved figuring out the hidden message buried throughout the book in its illustrations. Decoding the secret message was so much fun that the whole family got involved. 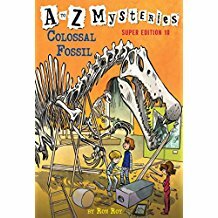 Well, we just picked up Ron Roy's latest Super Edition (#10) Colossal Fossil. It does not disappoint! Dink, Josh, and Ruth Rose are on vacation in Boston while tagging along on a parent's business trip. While there, they are spending the night in a museum that features large dinosaur skeletons. Don't miss this fun book! I highly recommend it and all of the rest of the books in the series. If you have a struggling or disinterested reader at home, pick up these books and start them as family read alouds. You will have your child (and you!) hooked in no time! The only problem our family has with these books is putting them away at bedtime. There is always a plea for just 1 more chapter!